Constructed from galvanized steel hand-forged by hammer and anvil, the Classico Wrought Iron Sectional with Santorini Fire Table by OW Lee showcases luxury comfort and old-world artisanship.Sectional pieces that can be put together in various configurations make this set the perfect addition to any outdoor space. 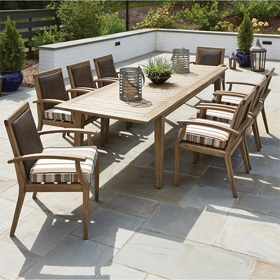 All seating in this collection has full back and seat cushions to provide comfort unmatched by any other manufacturer. The centerpiece of this set is the Santorini Occasional Height Fire Table sure to provide your gatherings with warmth and light for many seasons to come. To keep refreshments or decorations close, this set includes two side tables. Classico furniture is made to order in your choice of color and is guaranteed to resist mold, mildew, and fading. Lifestyle Photo:Shown in Copper Canyon Frame Finish with Sectional in Scopp Brick (OD80AA), Lounge Chair in Jinga Sienna (OD64A). Table Tops in Roma II. Left Sectional 27.5"W x 35.75"D x 35.5"H 50 lbs. Right Sectional 25.75"W x 35.75"D x 35.5"H 50 lbs. Armless Sectional 25"W x 35.75"D x 35.5"H 43 lbs. Double Corner Sectional 53"W x 33"D x 35.5"H 88 lbs. Swivel Rocker 42.5"W x 62"D x 45.5"H 123 lbs. Fire Table 72"W x 42"D x 19"H 300 lbs. Side Table 24"W x 15"D x 30.5"H 47 lbs.